On Wednesday, January 12, Cubadebate Website was notified by YouTube technical center--owned by Google--that its page on that network had been closed following a claim for copyright infraction. The issue particularly referred to a piece of a video on the presentation in Miami of the Legal Fund for terrorist Luis Posada Carriles, which we recently posted after having edited it out of a longer material that was published on the Network, and which had been reproduced by several sites, without any credit. Following the claim by the person who filmed the ceremony in which former CIA agent Luis Posada Carriles announced that he would be in Cuba this year and he demanded pay for his services--including the bombing of a civil Cuban airplane that claimed 73 lives--Google immediately cancel Cubadebate's site on YouTube. 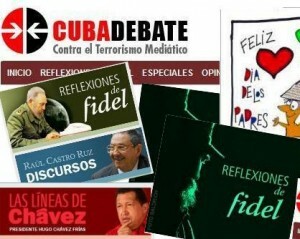 At that moment, Cubadebate had uploaded over 400 videos and reported 1,5 million downloads, since it was opened nearly three years ago. impunity of Miami-based terrorists and which, due to this reason, are important for our news production. Those who have followed our videos know well that the large majority of them were original and that every time we use other sources, we give them the appropriate credit, as long as they are properly identified. our consent, for campaigns aimed at demonizing the Cuban Revolution. Cubadebate's editorial staff demands the reinstatement of our YouTube service and we invite all our friends around the world to join our claim: STOP YOUTUBE CENSORSHIP! REINSTATE CUBADEBATE!